Where on earth has the week gone? I suddenly realise it’s friday and I don’t know what on earth happened to the Tuesday, Wednesday and Thursday bits. where did they go? I’m not entirely sure what there is to show for the week yet either, I threw some plates and a couple of teapots and two 4lb bowls and the plates and bowls are slipped, the teapots are joined and I’ve fired a bisque kiln and today glazed and packed that whole bundle of pots so they’ll be out monday. I’m looking forward to getting this batch of pots done, they are mainly orders for the incredibly patient people that are my customers. I really hate to keep people waiting and this kiln load has mainly been on order since Spring Fling or just before but obvious annoying things happened that put them all on hold. That’s partly what’s been going on this week actually now I come to think about it, I’ve been a bit achy and sore so it’s all been quite slow but still that doesn’t account for all the hours. In fact what about the last 7 months? Where did they go? It’s been crazy busy for a lot of it but it’s not two minutes since the ice age that was this last winter was upon us and this morning as I headed down the road there was a distinctly autumnal chill in the air – impossible I know but it did have that certain feel that is so very autumn. Fingers crossed it’s a just a blip, the day has been stunning after that so I can cope with autumnal mornings if they lead to fabulous days like today. Something happened to my owl this afternoon, not sure whether he’s more startled / stern / scary. Poor thing, none were the intention at all. I’ve had a work experience lady in today, I’ve never had anyone for work experience before. I’ve mentioned many times in many places that at some point I would like to have an apprentice, at the moment I don’t have the space to do such a thing at all and I feel that I don’t know anywhere near enough to be able to do that either. Today I wasn’t sure where to start so decided that I would just continue working through the things that needed doing and explain what I was doing as I went along. It’s really weird doing that but probably very good for me, there are so many things that you just do and don’t think about. It really makes you concentrate on what you do and why. Just the other day Sam, my accountant, highly recommended if you need someone by the way, called in and I was enthusiastically showing him the wood kiln which he’s heard about in bits and bats from Paul (they’re cycling buddies) I explained about where the pots go and stoking it to get it to temperature and where the flame will travel from the firebox through the chamber and out. He was a bit confused about how this big empty cuboid could hold the heat of 1060 degrees without it all escaping. It was only them that I realised that I’d failed to say that they doorway will get bricked up before I start the firing. Oops! Sorry Sam. Hope it’s all as clear as mud to you now. So I have sent Rhona away with some clay to make tiles with and she’ll have them at leather hard for when she next comes and we’ll do some slip decorating techniques. I think it’ll be good for her to have something to see quite quickly so even some simple tiles will be a good start to get the feel for working with slips I think. Any advice or suggestions gratefully received. The exhibition at Cambridge Contemporary Art seems to be going down well, that’s great news, thank you if you’ve been in there buying pots and huge thanks to the gallery for having my pots there. There will be some new ones heading down that way on monday so do pop in and have a look towards the end of the week for some fresh work there. If you’re not in Cambridge but happen to be in the York area then a new batch of pots have also just been delivered to Wild Hart on the Stonegate there, they have lots of jugs and a good assortment of money boxes. 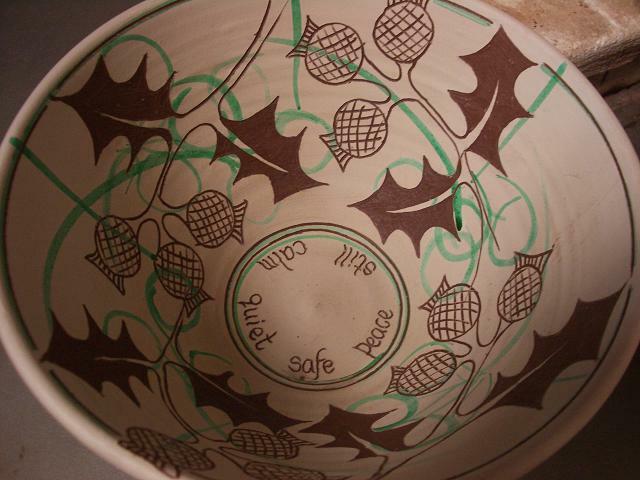 This entry was posted in bowls, Cambridge Contemporary Art, owl, plates, sgraffito, teapot, thistles, Wild Hart, work experience. Bookmark the permalink. I really love the owl. 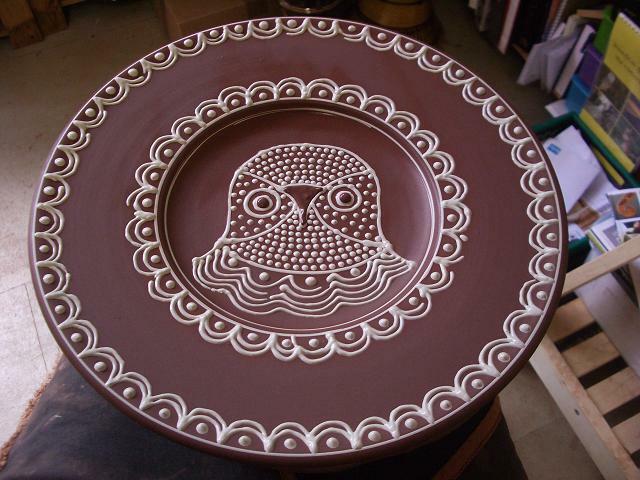 I think YOU would like this: http://elizabethseaver.blogspot.com/2010/08/night-owls.html Will that work? I woke up this morning, thinking it was Tuesday, some one must have stolen the rest of the week down here as well. awwww lovely stuff H sounds like you packed in a stack of work for one week well done….and wow you missed the almighty firecracking session on MK's page it was rather funny post tense of course, some neck hairs got rather riled!! was really quite a good exchange!! happy wkd then.. The government will be introducing the 48hr day and 12 day week and retirement will be 90 – no worries then re time!! gosh – I would love to follow you around and watch you work! I have always been attracted to slip ware and would love to be a fly on the wall watching how it is all done.It is funny how we just do the things we do- they become second nature.And it is funny when someone slows you down enough to make you think about it. When this happens it makes me feel as if i am outside the body watching what I am doing….